Jaipur, 23 April: The development of tourism infrastructure in Rajasthan is being given high priority in terms of new tourism products including new circuits in the state. This was stated today by the Additional Chief Secretary, Tourism, Government of Rajasthan, Mr. NC Goel at the inaugural session of the 9th edition of the Great Indian Travel Bazaar (GITB) at Hotel Lalit in Jaipur. Mr. Goel said that the State has already submitted proposals to the Union Tourism Ministry to the tune of Rs. 500 crores for developing innovative circuits like Spiritual, Heritage, Mega Desert, Tribal and Eco-Adventure. Some infrastructure projects under the schemes of PRASAD and SWADESH were also being developed. Owing to the development of infrastructure as well as an aggressive and creative marketing campaign, in the year 2016, Rajasthan registered an impressive growth of domestic tourist arrivals by 18% while that of foreign tourist arrivals by 3 %. In the current year, the tourist arrival trends are suggesting even better growth. Joint Secretary, Tourism, Government of India, Mr. Suman Billa said that there has been an impressive growth of foreign tourist arrivals in the country to the tune of 11% and around 9% in domestic tourist arrivals in 2016. The trend in the initial months of 2017 indicate a growth of 16 %. He said that a primary reason for a quantum jump in the tourist arrivals was also owing to the electronic visa facility. In November 2014 when the scheme began in India, only 16 countries were being extended this facility which has now expanded to a whopping 168 countries. 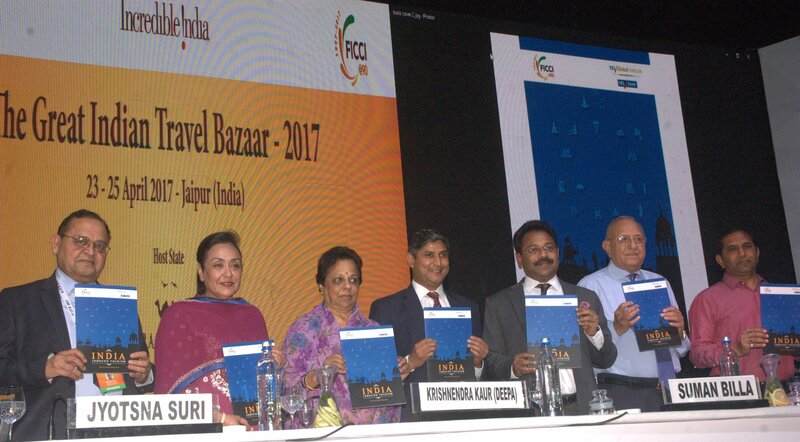 Chairman Tourism Committee, FICCI, Dr. Jyotsna Suri said that the Great Indian Travel Bazaar is the most significant platform and the sole promoter of Inbound Tourism in India. Giving a snapshot of GITB over the past few years she highlighted that the number of buyers have increased from 260 to 275. There has also been significant rise in the number of B2B meetings from 3000 to 10,800 since it began. Two knowledge papers entitled ‘Rajasthan – Revelation Beyond the Obvious’ prepared by FICCI and MRSS as well as ‘India Inbound Tourism – The Next Growth Trajectory’ prepared by FICCI and YES Bank were released by the Minister of State for Tourism, Art & Culture, Ms. Krishnendra Kaur (Deepa) and the other dignitaries like Mr. NC Goel, Mr. Suman Billa, Ms. Jyotsna Suri, Mr. Rajendra Vijay , Mr. Bhim Singh and Mr. Rahul Chakravarty. It is to be noted that the Great Indian Travel Bazaar is organized by Department of Tourism, Government of Rajasthan, Ministry of Tourism, Government of India and Federation of Indian Chambers of Commerce and Industry (FICCI). It is supported by leading national and regional associations like Hotel & Restaurant Association of Rajasthan (HRAR), Indian Heritage Hotels Association (IHHA) and Rajasthan Association of Tour Operators (RATO).